I was asked to create a design board, based on a client’s existing picture of a peacock, which held special sentimental value for her. I loved the idea of pulling a look together with such vibrant colors. I was also thrilled when my client said she did not want boring beige walls in the area. The request was for a space to be used primarily as a home office, with additional seating area. 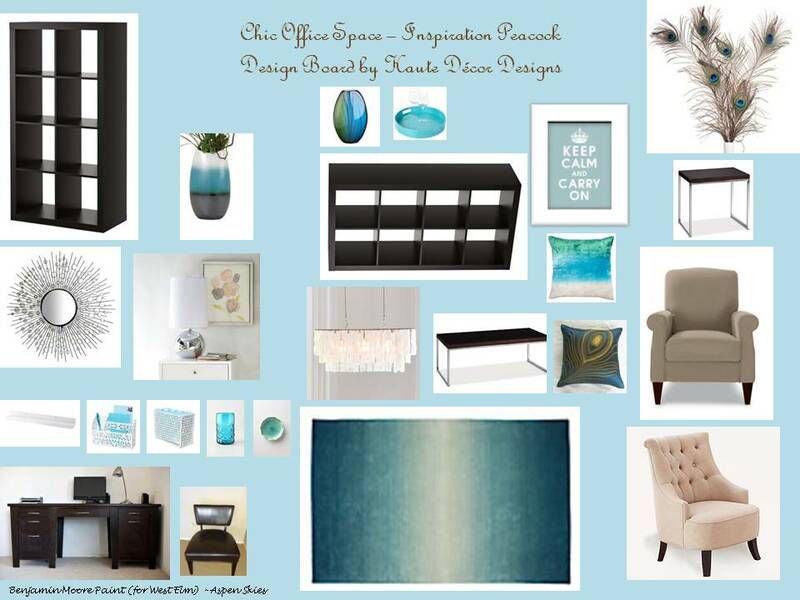 I provided my client with two color options – aqua and white or teal and chocolate; she chose the rich teal palette featuring jewel tone colors. We found several basic furniture items in dark brown, to ground the room, and added two comfy armchairs in a soft beige to balance out the room. Colorful accents and accessories in teal and white brought some life to the room, along with a fun capiz chandelier and aqua ombre area rug for the space. The total for all items came to about $3,000 which was a bit over the client’s $2,500 budget, but could be adjusted easily by carefully selecting other accessories in person while shopping. What do you think of this board? Does it tickle your feathers? Are you interested in your own design board? My rates start at $100 for virtual design services. Contact me for additional details. « Love is in the air..